Trying to decide where in Greece you should go next? Start your search here. Since the launch of Greece Is, one thing has become remarkably clear to us all. Greece is a never-ending source of amazing destinations. In our efforts to present all that Greece is in enjoyable features and handy guides, we have found that the more one explores, the more one finds there is to discover. With so many destinations to choose from, we though you might need some help deciding which place is right for you. The guide below doesn’t include every great spot in Greece by a long shot, but links to a few good starting points and suitable options, all divided into categories. 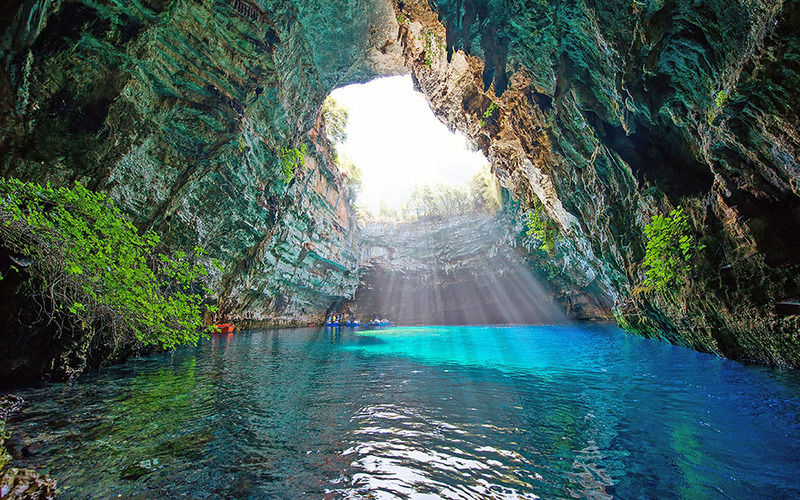 If what you look for on vacation is to be amazed by nature, Greece is your entertainment park. Five of the sites on UNESCO’s list of Global Geoparks can be found in the country. The island of Lesvos, with its petrified forest; the National Helmos-Vouraikos Park, in which you can enjoy nature while skiing down the slopes of Helmos; the Vikos-Aoos National Park, with the jaw-dropping Vikos Gorge; Sitia on Crete, with its Instagram-friendly palm tree forest; and Mount Ida, also on Crete, with its spectacular caverns, are all places you’ll never forget. But there’s more. Caves that will bring a chill down your spine (or at least make you wish your camera did better in dim light) are open to visitors all around the country. The beautiful blue caves are popular summer destinations, while wintertime visitors to the Diros Cave in the Peloponnese, might be lucky enough to get a tour guide all to themselves. Rock hounds and geologists will love a visit to the volcanos of Nisyros and Santorini, bird watchers will feel at home at Lake Kerkini, and anyone will gasp at the sight of the steep rock pillars of Meteora. And a visit to the mountains of Grevena will make you feel like you have been transported to the wilderness of the Canadian Rockies. If you’re particularly interested in wildlife, a wildlife photography safari might be for you. 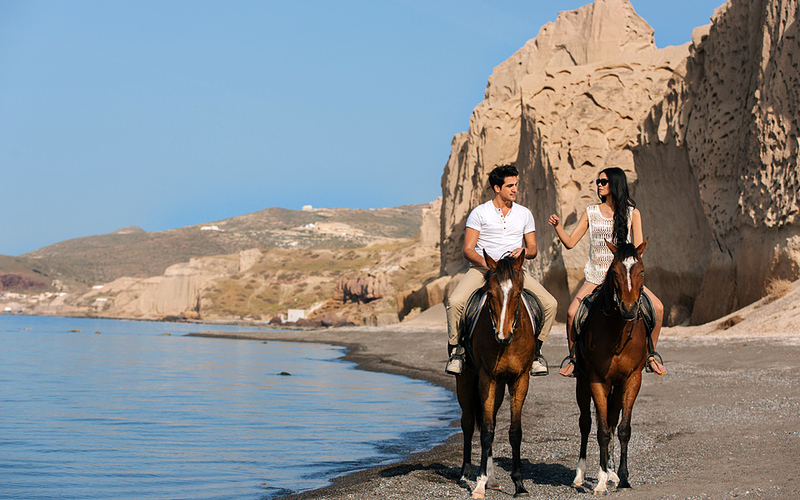 Family vacations at the beach – perhaps that’s what Greece is best known for. 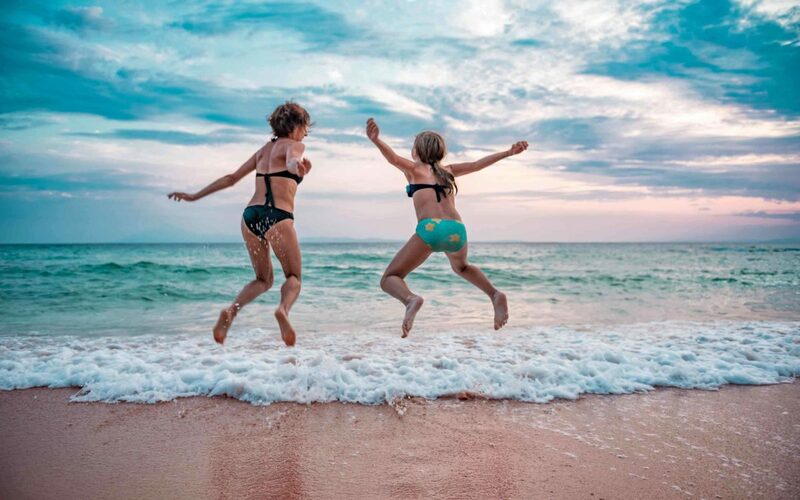 The sandy coastlines of the islands and mainland destinations, paired with the famous excellent weather and food that’s loved by young and old alike, has long made the country a go-to destination for families with kids. Still, if these basic things are what you’re looking for, you shouldn’t just head anywhere in the country. Some destinations are more suited to party-goers, some are too rural and isolated, and some are simply a bit too busy to enjoy with toddlers. Smaller islands with a developed tourism industry, like Paxos, Sifnos, and Alonissos are good choices, as are some of the larger islands which have managed to keep their tourism from growing out of control, like certain parts of Crete, Naxos, and Andros. On the mainland, Pilio is exciting for all members of the family, with its great variety of beaches, nature, villages and city life nearby. The high altitude of the villages and dense forest here provides lower temperatures in the hotter months, which can be a relief for parents. The Peloponnese is also a great place to explore with amazing ancient sites to introduce your kids to – like Mycenae and Olympia – as well as sleepy mountain villages and superb sandy beaches (particularly on the western coast). 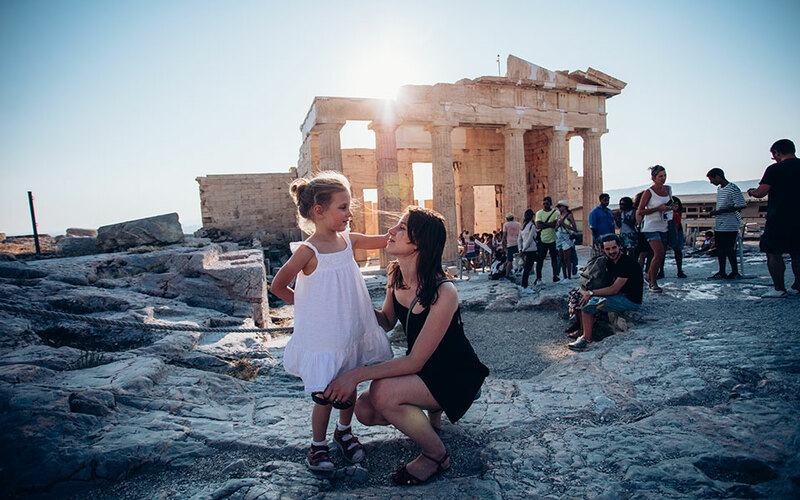 If you are visiting Athens with kids, here are some great tips. Greece offers so much more in terms of landscapes than olive groves and sandy beaches. 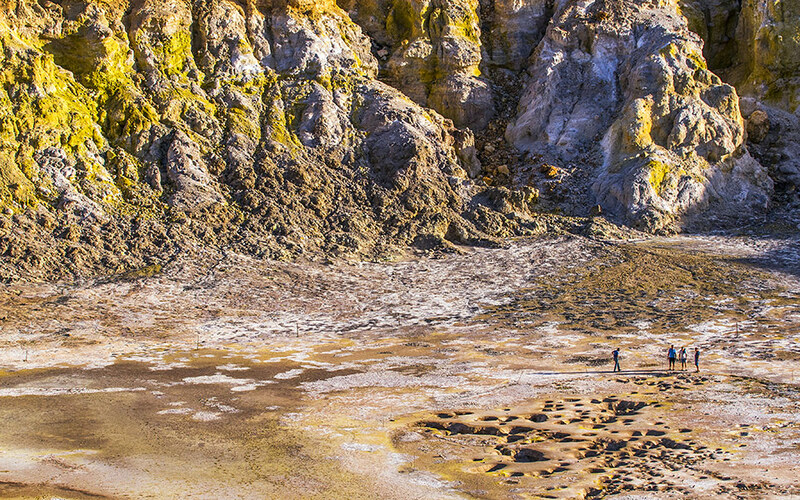 Thanks to the vast variety of terrain that can be found between the sea and the mountain tops, there are plenty of opportunities for those who love adventure sports and outdoor activities. At some destinations, like the islands of Kos and Kalymnos, you can even split your day between watersports and mountaineering. Aside from the places linked below, you can find more destinations for outdoor adventures here. On Crete, you can follow a section of the famous E4 European long-distance path (which starts in Portugal and ends in Cyprus) which runs across the entire length of the island. The full hike takes up to a month, and passes through rural villages and the countryside. Spending so much time anywhere might seem like a lot, but Crete has so much to offer that splitting your hike into smaller stretches and extending your stay will likely seem like a good idea. (You can read our magazine, Greece Is Crete 2018 here, or order it online here). Worth pointing our however, is that you don’t need to be extremely athletic or an experienced hiker to to experience some of the most famous paths in the country. 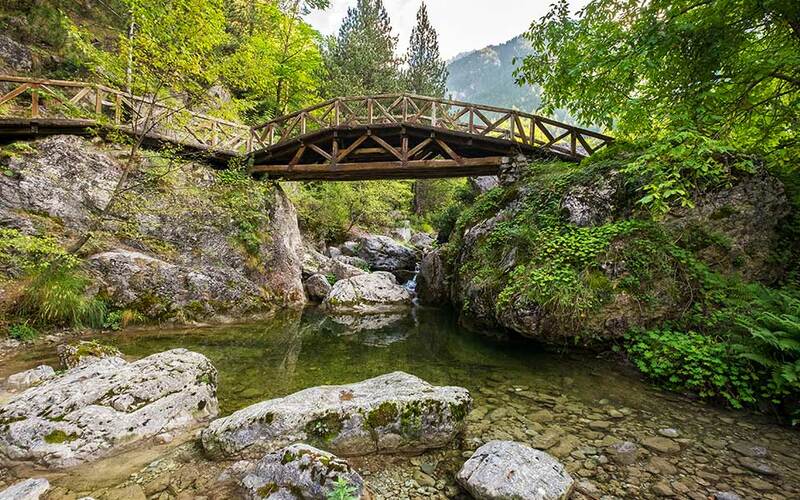 On Mount Olympus, another stretch of the the E4 takes you alongside the Enipeas River from the village of Litochoro to the site of Prionia in the heart of the mountain at an elevation of 1,100 meters. It’s a 5-6 hour hike, moderate in difficulty, and offers gorgeous landscapes transected by rivers and waterfalls. More wonderful paths we have covered can be found around Karpenisi towards the north, on islands like Kythnos, Sifnos and Folegandros, and on Mount Parnitha, which towers over Athens. You can find our guide to some excellent lesser known trails here, and read about the organizations Paths of Greece here. With mountains come climbing. The island of Kalymnos is possibly one of the best climbing destinations in the world: well organized and with incredible views. 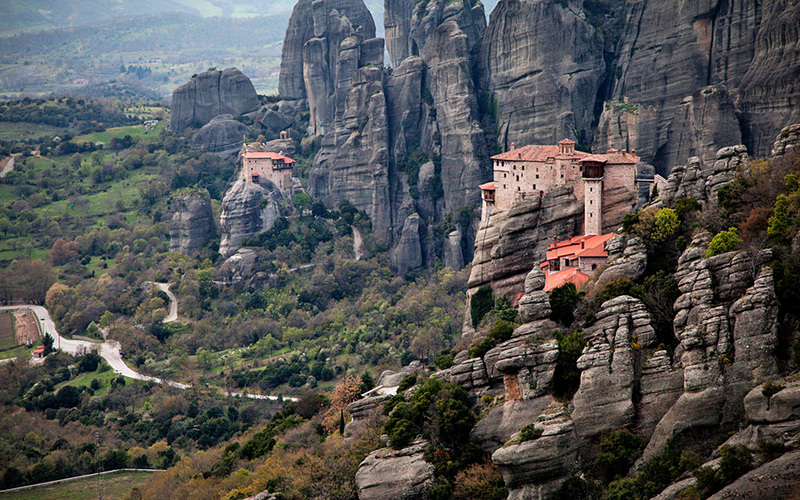 The rock pillars of Meteora, a UNESCO World Heritage Site, are also described as amazing by climbers, and in the Peloponnese, Leonidio is a significant up-and-coming rock-climbing destination. 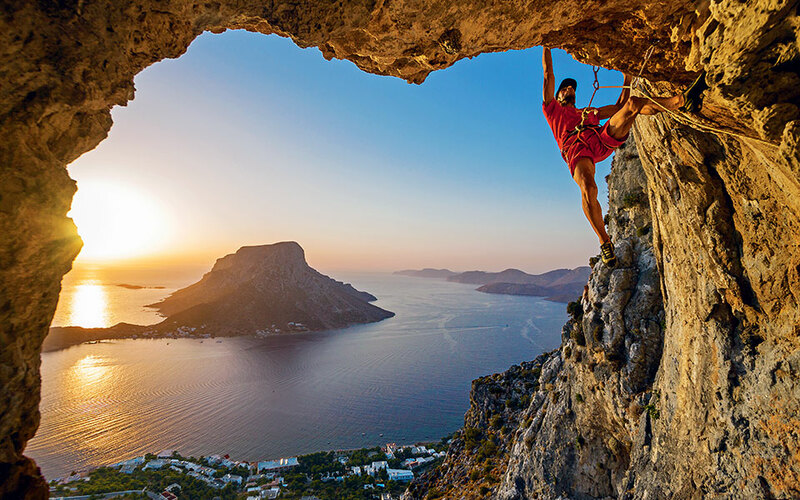 Read here about the six best places to go rock climbing in Greece. In July and August, conditions are perfect for surfing on many of the Greek islands. Go here for a list of the best places to windsurf in Greece and here for the best places to kitesurf. 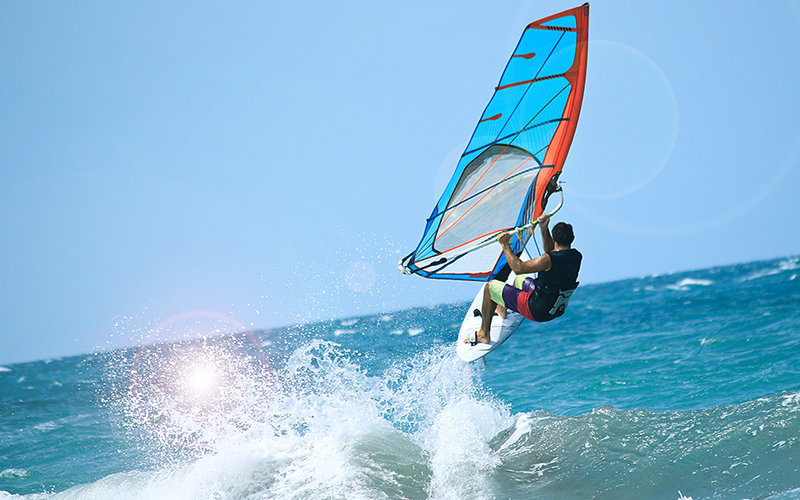 You can even enjoy some watersport fun just a short drive from downtown Athens (at Loutsa beach if you’re a kite surfer, or at Yabanaki or NAOVV if you want to windsurf). While the fish in the Greek seas may not be as colorful as those in the Caribbean, and you’re certainly not guaranteed to find a smooch-inclined dolphin, the warm waters do offer some pretty amazing sights. 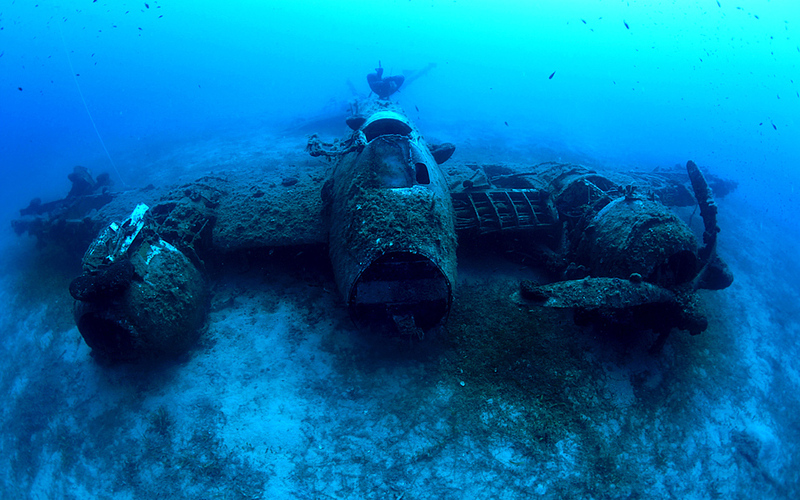 The many shipwrecks are perhaps most interesting (go here for a list of 10 wrecks to dive). Off the shores of Leros alone, for example, pitched WWII naval battles have left a legacy of dozens of accessible wrecks. If you’re an experienced diver and already had your fair share of wrecks, how about jumping into the heart of Santorini’s volcano? Yes, we said skiing. While it might not match the image of Greece you have in your mind, the high mountains mean the country does get snow. 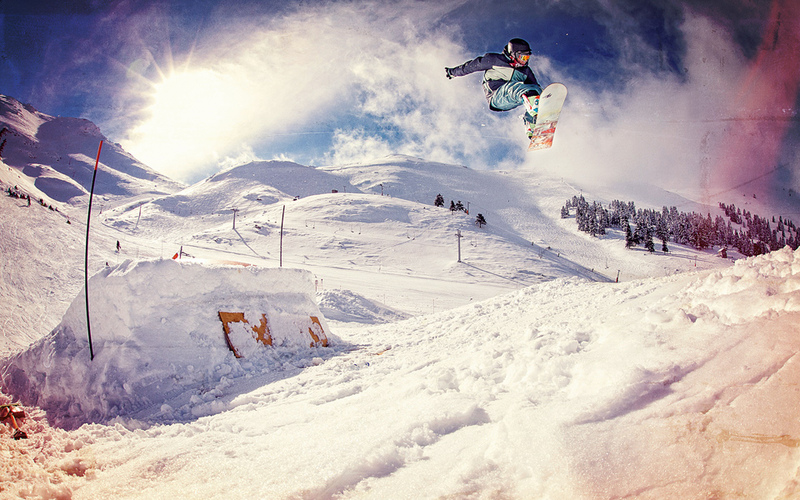 Go here for a list of the best ski resorts in Greece. A carafe of wine, two glasses and an amazing sunset. Barefoot walks on the beach. The smell of lavender and thyme. Perhaps a naked moonlight dip in the sea. Can you see it? Whether you’re a new couple or celebrating your 40th anniversary, there’s a place in Greece perfect for celebrating your love. The most famous place among newlyweds is Santorini, but places like Methoni and Koroni on the Peloponnese and the medieval castle town of Monemvasia have a fairytale-like feel that will leave you with memories just as romantic. 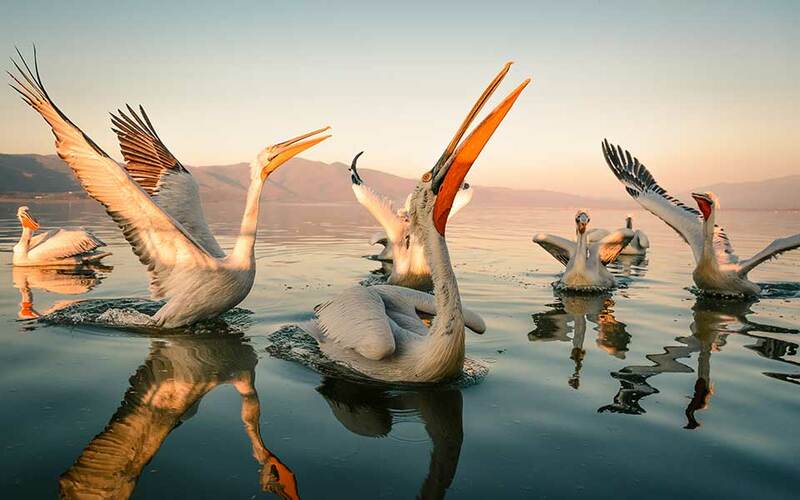 Greek lovebirds often choose the historic seaside city of Nafplio for weekend getaways. It’s just a few hours from Athens, but feels a lot like an island, or at least a world of its own. If your heart is set on an island, Kythira is said to have been the birthplace of Aphrodite, and visiting today one can see why the goddess of love would have chosen it. Destination weddings in Greece are great for many reasons, especially if you incorporate some of the local traditions in your special day (read more here). If you can, pick one of the tiny churches in this list to get hitched in. If you’re Greek Orthodox, finding an amazing one is especially easy. 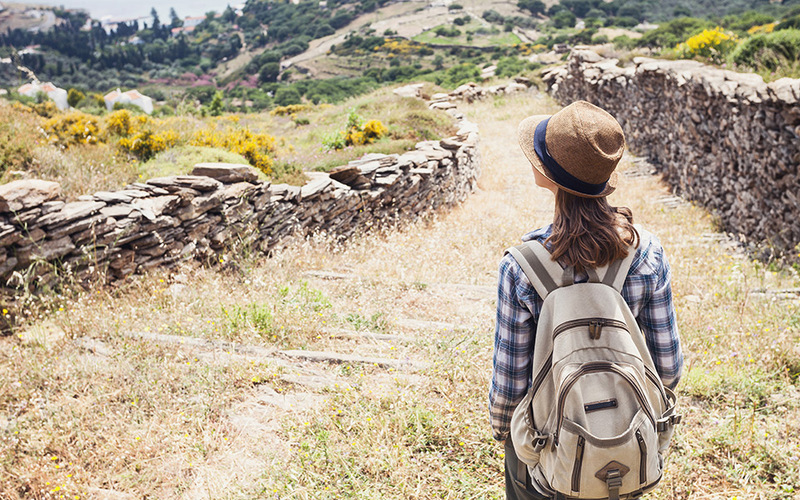 Some people may be comfortable going anywhere alone, but if that’s not you – perhaps it’s your first solo trip, some destinations can make you feel more comfortable than others. If you are looking to recharge and relax, you can’t go wrong on Ikaria. 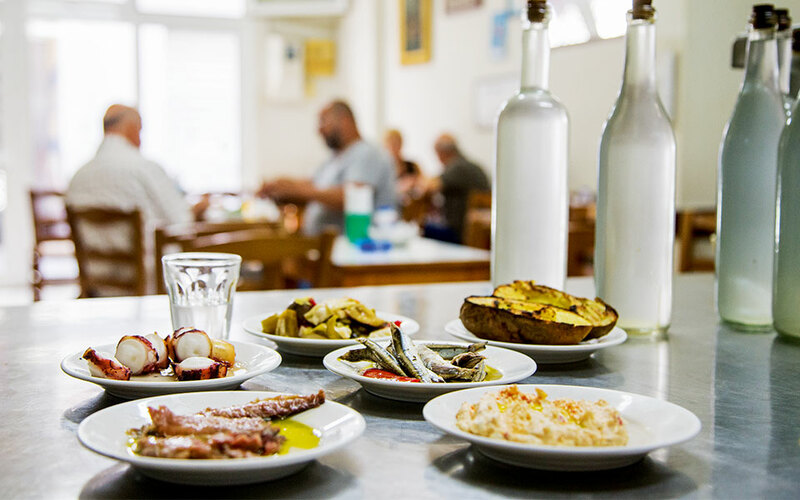 Here, on the Greek island known as one of the world’s Blue Zones (places around the globe known for longevity), you’ll be forced to adapt the same slow pace and daily routine as the locals, and enjoy some very good and healthy food. You can also find this kind of calm on many of the tiny islands in this list, and in places like the countryside of Crete. If you’re craving some real pampering on the other hand, have a look at this list of all the best spas in Greece. Find many more destination ideas for single travelers here. History buffs could probably spend their vacation in Greece every single year and never get bored. The country is quite literally scattered with remains from ancient history, and the sites that are organized and open to visitors are buzzing with activity during the high season. The natural first stop is Athens. What you may not know is that, magnificent as it is, it’s not all about the Acropolis here. The Ancient Agora with the Stoa of Attalos, the Roman Agora, Hadrianopolis, Pnyx Hill and the Panathenaic Stadium may also ring a bell to some. What you’ll only discover when you get here however, are the uncountable smaller archeological sites around the city. The fantastic museums complement the sites, and will turn your visit into a fascinating learning experience. 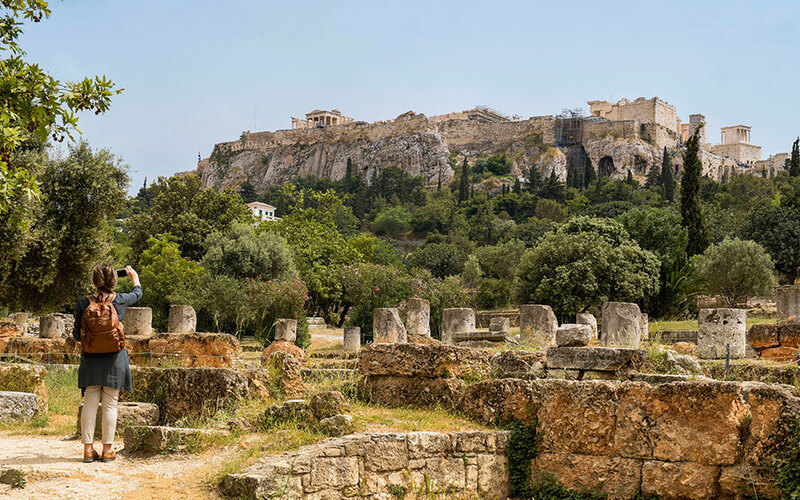 Find our latest guide to the most important ancient sites in Athens here. 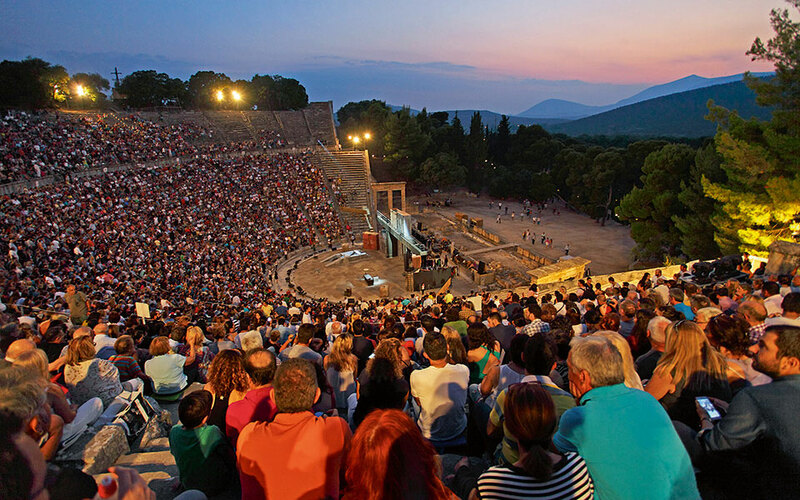 Not very far from Athens (about an hour by car), you’ll find Ancient Corinth, and a bit further (about two hours from Athens by car, on the Peloponnese), is Epidaurus, famous for its amphitheater where, in the summer, you can still catch a show. 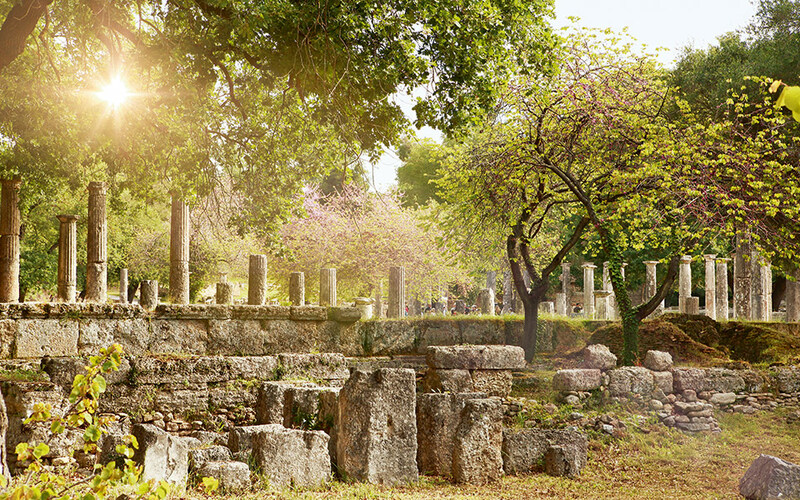 Ancient Olympia, where the Olympic Games were born, is also on the Peloponnese, and a popular destination for tourists and Greeks alike. Read about it here. Crete’s most famous Bronze Age archeological site is Knossos. The Minoan civilization once flourished here, and a visit to the old palace is a must when on the island. The area surrounding it is green, and time spent here is generally a pleasant break from the busy city of Heraklion – enjoyable even for those in your group who are perhaps not as crazy about history as you are. If you’re visiting Thessaloniki, a trip to Vergina (about an hour away by car) will not disappoint. This was once the center of Macedonian civilization, and features the tomb of Philip II, as well as one of the best archeological museums in the country. Vacationers on Mykonos on the other hand, shouldn’t miss the chance to pop over to the uninhabited island of Delos, once a hub of life and worship in the Cyclades, with festivals featuring theater, and ancient sports. Read all about it here. If you’re a fan of road trips and ancient theaters, we recommend this tour stretching from the island of Evia to Delphi. Greek gastronomy can mean many things. Of course, any trip will likely feature the famous lamb, moussaka, seafood, souvlaki, Greek salad and tzatziki. If you are a real foodie, however, you’ll want to go beyond those dishes. Organized food tourism is found all over the country, from island wineries to guesthouses in northern Greece where you can observe and take part in food production. Go here for a list of some of our favorite foodie destinations, where tastings are just the beginning. The nights are long in Greece – and the parties are often even longer, with revelers enjoying themselves until the sun has well and truly risen. It’s worth noting that great nightlife is available at most popular tourist destinations. 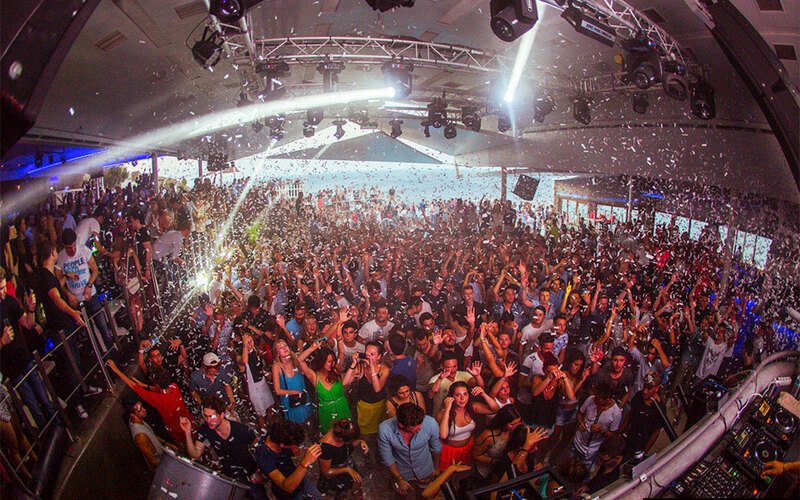 The shining (flashing disco light) star of the Greek party islands is Mykonos. While the island has a lot more to offer (read our magazine, Greece Is Mykonos 2018 here, or order it from our e-shop here), it is known first and foremost as a place young people go to dance, drink and flirt all hours of the day. Find our latest guide to the island’s best hangouts here. You should also consider Ios, Paros, Santorini, Kos, Corfu, and the Halkidiki peninsula. Another longtime favorite which is also an exceedingly popular destination among Greek vacationers looking to dance the night away is Hania, on Crete. The city has a lot to offer (read all about it here), and you can pair excellent nightlife with trips to some of the most famous beaches in the country.